Spiral welded steel pipe offers numerous advantages over conventional pipe. Greater strength in proportion to wall thickness of any competitive product means the pipe performs safely at higher pressures and its strength provides distinct handling and laying advantages in difficult locations. The weld is significantly less affected by circumferential stress than alternative products, and the pipe combines well with a range of coating and lining systems tailored for specific uses. 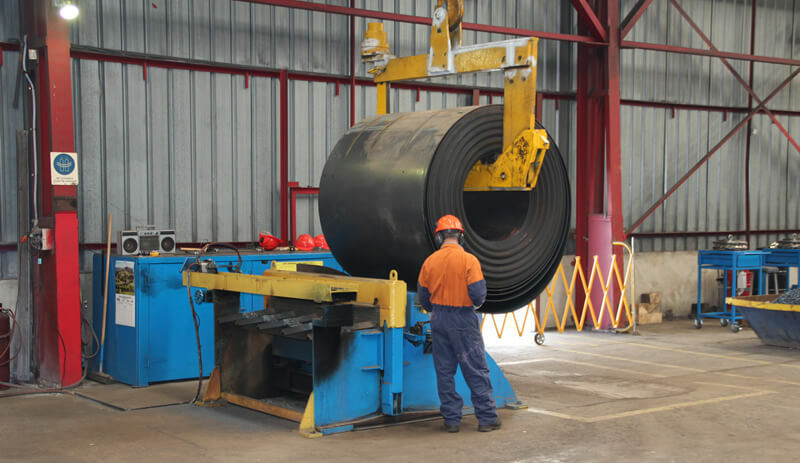 Steelpipe’s manufacturing facility operates under accredited QA systems, producing high quality pipe to Australian, New Zealand and other specified standards. Management systems are accredited with the AS/NZS ISO 9001 Quality System to ensure that our products are fit for purpose and will continue to perform throughout there life expectancy. Steel is 100% recyclable and is the most recycled material in the world. We source our steel from New Zealand Steel, a company manufacturing high quality steel from the vast iron sand deposits on New Zealand’s West Coast. All materials used in New Zealand Steel’s manufacturing process are sourced locally in New Zealand. We purchase our steel as hot rolled coil in either mill edge or slit edge format. The product fully complies with international specifications.